The top four NWT list of a world traveller. Begin your northern adventure in the capital of the Northwest Territories, Yellowknife, located on Great Slave Lake. Yellowknife has been the capital since 1967, and is connected by air to nearly all destinations in the Northwest Territories. Once glittering with gold from its history as a 1930's mining camp, the city now contains two gold mines, a booming diamond industry, and a bunch of very friendly northerners! Yellowknife took its name from the copper knives carried by the Chipewyan Indians in the area. The Dene and other First Nations cultures can be explored at the Prince of Wales Northern Heritage Centre, where exhibits on the fur trade, transportation, natural history, artwork and handicrafts can be seen. Check out the Bush Pilot's Monument, a memorial to bush plane pilots who explored and helped in the development of the Northwest Territories. The monument is located atop a giant solid mass of Precambrian Shield, where there is a great view of the entire old town, as well as of Great Slave Lake. For the adventurous traveler, there are several outfitters and tour companies located here, and several nearby trails offer excellent hikes, including the hard-core Prospector's Trail in Fred Henne Park, a difficult 4 km (2.5 mi.) loop that will keep you sweating! Although the winters are long and cold, there is never a dull moment in the north. The stunning Northern Lights dance in the sky with pastel colours between the months of October and February. Snowmobiling, dogsledding, and igloo making will keep you busy in the snow, and the hospitality of the people here will warm your heart. 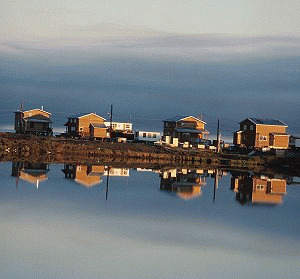 Book accommodations in Yellowknife and refresh your spirit with the beauty of the north. Captain-Ron's Bed and Breakfast B&B Yellowknife #8 Lessard Dr.